We went to see the film Insurgent last week, without realising that it is the second film in the Divergent series (in fact, even after watching the film we were blissfully unaware until we did a bit of googling about it later on). Somehow the first film must have passed us by last year. So if you haven’t seen the first film, don’t worry, it clearly isn’t a barrier to going to see the second *but don’t read any further because there will be spoilers! (We did wonder why Jeanine had a bandaged hand for the whole film – perhaps this was explained in the first film?) The films are based on a so-called ‘young adult’ series of books, which we knew nothing about either – so this is entirely about the film based on having only seen the second. I found the factions an interesting premise for a series, putting people into groups based on their personality traits doesn’t necessarily bode well. I’m not sure that people get along best with others with the same personality traits. The film suggests that it has worked for a while. It is interesting that there are many ‘factionless’ people, not because they don’t have the same traits as others, but because many of them have chosen to be factionless through rebellion. The factionless are therefore outcasts, unable to live in the areas controlled by the different factions, except for the one area that does take in these homeless people, Abnegation. There are also divergent people, who don’t fit neatly into one of the factions. The ultimate goal is for someone to be 100% divergent, or in other words, have all five traits, in order to open the message from the founders and progress society beyond the faction level. The young female protagist, Tris, is just the person. She completes the tests for all the factions and then we’re off to a whole new world (in the next film). The brave, altruistic, young Tris is a foil for the hard-faced, self-serving female leader Jeanine, who controls all of the factions. This part of the plot reminded me of The Hunger Games, where the well-off people sit in the capitol controlling the other sections, whilst the others work hard. There is a similar undertone of societal critique of the fat cats sitting in our capital cities, earning lots, spending lots, and using the poor for entertainment or sport. Although Jeanine is defeated in the end, Tris’ main enemy turns out to be herself. 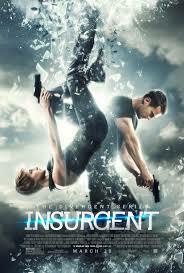 The culmination of passing all of the faction tests hangs on Tris forgiving herself for hurting others. The film does a good job of highlighting the fact that sometimes we can be our own worst enemies, and it is often our own inability to let something go that hinders our progress. It does sound a bit cliched, but nonetheless is a key message. The film was an entertaining watch, but the plot did seem a little forced. Although the concepts were interesting, it seems a little far-fetched, and doesn’t flow as smoothly as it might. I didn’t really get the idea of the sim implants that were shot at people which meant they could then be controlled – Tris had one of these so instead of killing others to make her come into Erudite HQ, she could have been controlled?! Also, the bandage not explained thing. Worth a watch though.